The World Showdown of Esports is back with another world-class esports competition! We are thrilled to announce a return to one of our previously showcased games and the first opportunity for a WSOE Champion to defend their title. 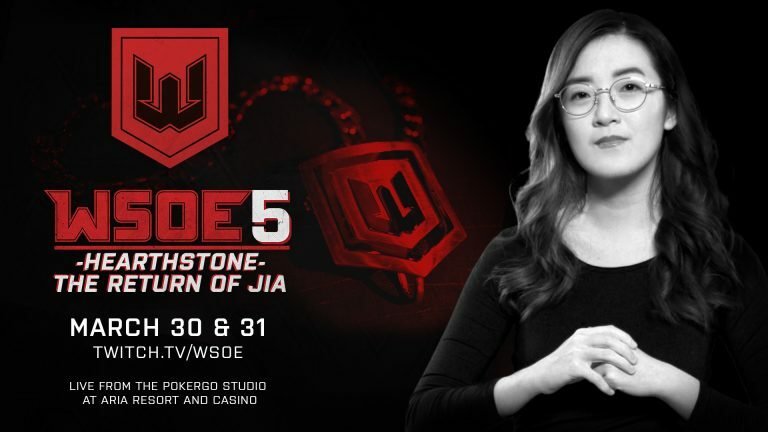 WSOE 5: Hearthstone – The Return of Jia will be a unique event featuring four invited competitors vying for the chance to face our reigning champion from WSOE 2, Jia, and attempt to claim the title for themselves in one final high-stakes match! For the first time, our competitors will have a chance at redemption and Jia will have the opportunity to cement her place in the Hearthstone esports history books with a successful defense. Day 1 of WSOE 5 will be a double-elimination, Last Hero Standing tournament format to determine which player will challenge Jia for the title. Day 2 will feature the debut of our preliminary card: a series of 1 on 1 matches between our competitors and special invitees, battling for $2,500 per match! After the field narrows and our preliminary card concludes, the main event will take place: our top competitor vs. Jia for the WSOE Champion title and $15,000! In total, there will be $38,000 up for grabs including our unique “bout bounties” for most consecutive wins and most reverse sweeps throughout the event. Jia is not the only familiar face that will be attending WSOE 5, as WSOE 2 runner-up and fan favorite Cora “Songbird” Georgiou will be returning for another shot at the title. On our talent team, Dan “Frodan” Chou will be in the building to call the plays and Lauren Jbara returns as reporter! Tune in to http://twitch.tv/WSOE on Saturday, March 30 and Sunday, March 31 for all of the face-hitting and spell-slinging action. Streams begin on both days at 9:30 a.m. PDT!